A pre and postnatal treatment, which improves skin texture, elasticity and reduces stretch marks. This treatment rejuvenates the body and increases immunity. Made with Sesame Oil, Gooseberry, Vetiver, Indian Madder and SidaCordifolia, also know as Bala in Ayurveda. Explore the entire range of Face Treatment available on Nykaa. 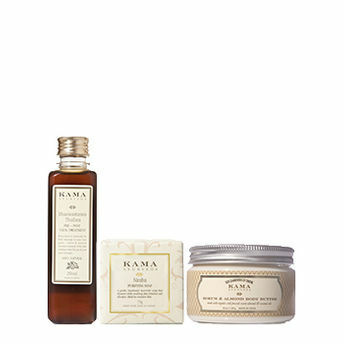 Shop more Kama Ayurveda products here. Alternatively, you can also find many more products from the Kama Ayurveda Dhanwantaram Thailam pre-post natal Treatment Oil range. Pure vegetable, handmade soap to calm sensitive and difficult skin. Protecting your skin daily from the harsh pollutants in the atmosphere and from the rigors of a stressful will help keep your skin in perfect balance. A daily skin care routine is crucial to your skin's health and comfort. This soap-free cleanser deeply cleanses the pores and also calms and soothes the skin.This a gentle, handmade Ayurvedic soap that cleanses while soothing skin irritation and allergies.